The Girl With Ghost Eyes by M.H. 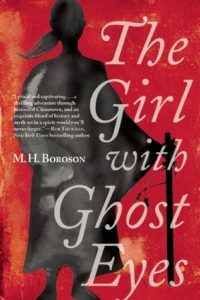 Boroson was a recent title read by the library’s Hauntingly Good Reads book club. First line: I placed a paper shirt into the furnace. Summary: Li-Lin is a young widow who is also the daughter of a renowned Daoshi exorcist, living in San Francisco’s late 19th-century Chinatown. She also has yin eyes, which lets her see the spirit world. This ability is a shame to her family, along with the death of her husband. Adventure ensues after a sorcerer cripples her father. She is joined by a tiny sidekick on her travels through the spirit world. Highlights: This book is loaded with Chinese mythology and tradition. It also has an engaging storyline, wonderful characters both good and bad, and a heroine you can’t help but cheer for. It has humor and suspense and sadness and mystery and will make you angry and will make you want to cry. Lowlights (or what could have been better): The only thing that could be better is if this author would hurry up and write another story that features Li-Lin. I want to go on a another adventure with her. FYI: If you are at all interested in Chinese mythology/religion/beliefs, or just love a great story, this book is for you.